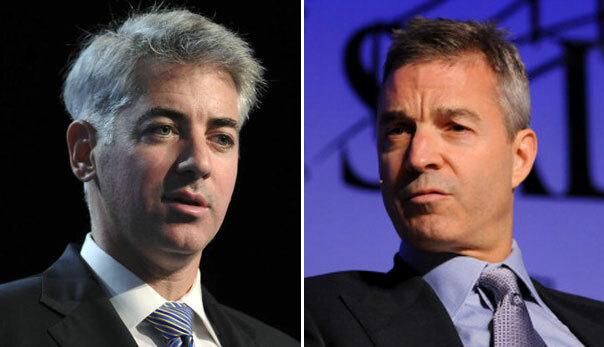 Bloomberg via Getty Images William 'Bill' Ackman founder and CEO of Pershing Square Capital Management (left) Daniel Loeb, founder and CEO of Third Point: Two activist investors taking big positions in large public companies and demand even bigger changes. Is activist investing a force for good when it comes to shareholders? Recent events, namely the Bill Ackman-J.C. Penney (JCP) debacle, have left investors and analysts tired of the outspoken hedge-funders of the world. There are, of course, plenty of activists whose actions have enhanced not just their funds' portfolios, but those of passive, minority shareholders. They've forced companies to make positive changes -- to restructure, elect new board members, and get back on track toward healthier operations. Then again, others end up like J.C. Penney -- a seemingly lost business, rich with legacy yet left crippled by boardroom drama. That leaves us -- the average consumers and investors -- with a pressing question: Are these megaphoned power players trying to effect change that will benefit all, the company included? Or are they just after results that will juice their own returns? While many activist investors consider themselves to be molded in the image of a certain Omaha-based super-investor, many of today's hedge fund superstars have taken a very different approach to the craft of identifying mispriced securities. Like the old guard -- raiders like Carl Icahn and Nelson Peltz -- young guns such as Daniel Loeb and Bill Ackman take substantial positions in large public companies and demand change in an approach that is about as far from Warren Buffett's investor behavior as one can get. Their style can be best described as personality-driven activism. The practice is on the rise, too. According to FactSet, 2012 saw 21 activist campaigns in companies with market caps larger than $1 billion. In 2010, the number was 11. In 2003, there were four. While some passive shareholders may welcome a helping hand if their pick isn't performing, outsiders seem to be more bothered by the nasty tenor of the dealings. Perennial nice guy George Clooney has spoken out against hedge fund investor Loeb -- a major investor in Sony (SNE) -- going as far as to call the investor a "carpet bagger ... What he's doing is scaring studios and pushing them to make decisions from a place of fear." Even Buffett advised Apple (AAPL) CEO Tim Cook to pay as little attention to David Einhorn as possible, and just focus on running the company. You get the point: Activist investing tends to generate opinions. As an individual investor, should you avoid swimming in the same pool as headline-generating sharks? Or is the presence of an activist investor a reason to wade in and test the waters? Yahoo (YHOO) is a recent example of the complex activist-management relationship. Loeb took a substantial position in the troubled Internet company, acquired a board seat, ousted then-CEO Scott Thompson, and then spearheaded a campaign to hire Marissa Mayer, who has since gone on to become known as a miracle worker -- the savior of Yahoo. Now, it's not certain that Mayer would not have joined Yahoo without Loeb's presence, but even the CEO herself acknowledges the investor's vision for the company, whose stock is up more than 80 percent in just 12 months. If the story ended there, we'd have an activist-management success story. But it doesn't. Earlier this month, Loeb resigned from the board and dumped his shares, claiming Mayer did not heed his advice to lay off up to 30 percent of the company -- a condition he originally campaigned for and Mayer had agreed to. There are other ways the activist-management relationship can go. Consider the dealings of another large fund, Elliott Advisors, which amassed a tremendous stake in National Express (NEX) -- the U.K. transportation conglomerate. Following the usual recipe, Elliott attempted to conduct a board coup d'etat, and gain greater influence over the direction of the company in hopes of breaking it up and selling off the pieces. The battle raged throughout 2011, but the fund never achieved its coveted board seats. In March of this year, Elliott dumped half of its stake in the company. Since March 2011 through April of this year, the stock had plummeted nearly 20 percent -- lagging the S&P 500 by roughly 40 percent. In the meantime, the company spent millions fighting off Elliott -- a distraction that certainly took management's focus away from the continued operations of its businesses. Then, of course, there is the sad story of J.C. Penney and Bill Ackman. With as much attention as the story has gotten, there is no reason to recount details, other than cementing the fact that J.C. Penney has alienated its already weak shopper base, gone through a variety of managers, and lost billions in market value -- bringing Ackman and other shareholders down with it. It's not that Ackman had malicious intent for the company -- he could have pushed for its dissolution or for taking it private, but instead he truly believed in the viability of the business, and put a retail genius (though in a much different business) in the driver's seat to make it happen. Things didn't work out, and nearly every media outlet, in addition to Wall Street, has vilified Ackman. As the investor exits his position, various other vocal investors -- from George Soros to Kyle Bass -- have snatched up roughly one-third of the company's stock in hopes of achieving what Ackman couldn't. Who Ultimately Pays the Price? There is little doubt that activist investing is a growing game here in the United States. And, with more players, we may see corporations armoring up to protect themselves. And that's not good news for investors. Companies will have to spend more on legal expenses and anti-activist strategy-making, and undergo boardroom shuffles that, at their core, do not necessarily have direct positive impacts on the operating business. Another takeover defense is the "poison pill" tactic -- flooding the market with shares to prevent any one investor from gaining too much ownership, but also diluting existing shareholders. Some firms need change, and some firms need an outsider, outspoken party to encourage or force that change. However, it may end up being a minority that ends up creating positive change, while many activist stakes could end up plaguing retail investors with extra costs, internal turmoil, and in the worst case, a loss of direction. Motley Fool contributor Michael Lewis has no position in any stocks mentioned. The Motley Fool recommends Yahoo!. Try any of our Foolish newsletter services free for 30 days. Should You Take Financial Advice From Celebrities? Best known for his days as Arthur Herbert Fonzarelli (aka The Fonz) from "Happy Days," Henry Winkler has recently become the spokesman for Quicken Loans' reverse mortgage business. What It Is: Typically aimed at seniors, a reverse mortgage provides homeowners with monthly payments based on the equity of their house. As the homeowner, you retain the title to your home until you die, move or sell the home, at which time the principal and interest owed on the loan is repaid from the sale proceeds. The Bottom Line: While a reverse mortgage may be a good choice for seniors in good health who need additional income and do not plan to leave their houses to their heirs, not every homeowner's situation fits that description. Even if The Fonz tells you "Ayyyy -- these are great," be sure to do your research, shop around, and make sure you're getting terms that work for you. Otherwise, you might be jumping the shark with your finances. Prepaid debit cards are a hot item to endorse. After all, what celebrity wouldn't want their fans thinking about them every time they open their wallets? Record executive Russell Simmons' RushCard was one of the first on the scene in 2003. Reality-TV family the Kardashians' pushed a card in 2010. Even celebrity financial expert Suze Orman got in on the action with her Approved card in 2012. What It Is: Think debit cards without a full bank account backing them up. Customers can add money to their cards, then use them to pay bills, shop, and for other transactions. The bottom line: Prepaid debit cards have become a popular and lucrative business for the institutions that sell them, but they are frequently less of a deal for the people who buy them. Often promoted as a good tool for consumers who do not have access to traditional banking, prepaid cards usually come with high fees that pop up on almost any transaction. The Kardashian prepaid debit card cost around $100 a year just to get started, which was so outright predatory that the product was discontinued after three weeks -- and only 250 cards were ever sold. The RushCard has monthly fees tied to it, though it is advertised as a low-cost option for consumers. And while Suze Orman's card has some additional perks, like free credit reports and credit monitoring for customers, financial experts still question the fees for monthly use and transactions. Prepaid cards are a great option for a few situations, like if you're going on vacation and don't want to take cash; if you want to give a teenager access to money without the ability to overdraw their account; or for online shopping or bill payments. But buyer beware: Though the stars have aligned for prepaid cards in TV ads, make sure you read through the fee schedules to be certain the card you choose makes sense for your needs. Need cash fast? Former talk-show host Montel Williams has been spouting the praises of MoneyMutual for quite a while now. What it is: MoneyMutual is a middleman, connecting customers with lenders to make deals on loans. Aimed at people who need short-term loans for things like bills or groceries but have poor credit, MoneyMutual's loans have very strict terms that may not be the best option for most customers. Payday loans, like the ones provided through MoneyMutual, usually come with very high interest rates, penalties and fees. The fine print on Montel's commercials makes it clear that the interest on these loans could climb higher than 100 percent -- effectively meaning you'd repay more than twice what you borrowed. There are also loan payoff time limits. If you don't meet them, you'll incur additional costs on top of the high interest you are already paying. The bottom line: This financial product is almost never a suitable choice. However, if you find yourself in the need of some fast cash (when there's no other way to obtain a loan or pay for an emergency expense with a credit card), please be sure to review all of the information (terms, fees, rates, etc.) before signing on the dotted line. We all love her. Most famous for her role as Rose on "The Golden Girls," Betty White has made a comeback in recent years -- showing us that she is just as fun and spunky as ever. And it may be her fun-loving spirit that attracted The Lifeline Program to her. What it is: Lifeline buys life insurance policies from people who determine that they no longer need them in exchange for a cash settlement -- aka, a viatical settlement. The bottom line: A viatical settlement is a simple way to get cash out of a life insurance policy before you die, and there are situations where such a settlement can be useful. For example, a divorcee who no longer needs a policy or a senior who may be thinking of letting the policy lapse instead of continuing to pay premiums could benefit from selling it. But it can be hard to figure out whether Lifeline is really giving you a good deal for your policy, because its fair value is based on life expectancy, mortality tables, and similarly complex concepts. Admittedly, getting something is better than getting nothing, but shopping around may get you a better deal. Moreover, you should talk with your insurance provider to see if other alternatives are available that may give you more money or benefits than simply selling your policy to Lifeline. It's hard not to get pumped up when Hulk Hogan comes on the screen and does his shtick. Add Troy Aikman and you have a celebrity endorsement dream team. Even so, customers need to be aware of the math behind the Rent-A-Center business plan. What it is: Aimed at customers who need or want new furniture, appliances or electronics but don't have the cash to pay up front or the credit to buy from a traditional store, Rent-A-Center allows customers to participate in rent-to-own plans, paying low rates for their goods. The bottom line: RAC's plan sounds great -- preapproved, no credit check, no growing interest, flexible payments, etc. -- but a close look at the payment terms may cause a bit of a shock. For instance, say you want to get the advertised 15.6-inch Asus laptop computer using the company's low weekly payments. At $19.99 per week for 65 weeks, you would pay a total of $1,299.35, but the same laptop could be purchased from numerous retailers for $400. Hulk may be a former WWE superstar and Aikman may be a former MVP quarterback, but neither of these guys can decide whether RAC's terms are right for you. Before you do your best Hulk impression or start your touchdown celebration, check out the total cost of the merchandise you want and be sure the rent-to-own plan is the best option for you.